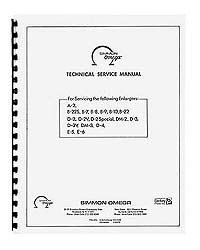 High quality copy of the original 1971 Omega Technical Service Manual. This manual includes alignment procedures, as well as instructions for periodic maintenance and a basic troubleshooting chart for the following Omega enlargers: A-2, B-22, B-7, B-8, B-9, B-10, D2, D2V, DM-2, D-3, DM-3, D-4, E-5, and E-6. This deluxe reproduction features a comb binding so it will lie flat for easy reference, front and back covers on heavy cover stock, and a clear plastic cover page for added protection and durability. 8½" x 11" format. Comb bound. 13 pages.